We're happy to offer the Kids' 100 Yard Dash in addition to our longer distance events, the 5K and half marathon. The 100 Yard Dash will begin at 7:00 am (the half marathon starts at 7:30 am, and the 5K starts at 7:45 am). This way, parents can participate with their children before their own race. 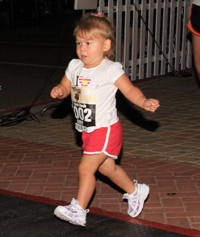 Register your child now for the Kids' 100 Yard Dash!